The Hevajrantra, the well-known Anuttarayogatantra, about `unsurpassed yoga`, is a direct successor of the Tattvasamgraha, a yogatantra. 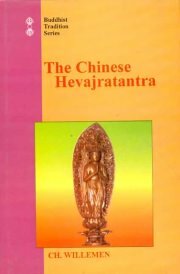 It was translated from Sanskrit into Chinese in the 11th century. The Chinese translators offer a text which remains true to its contents, but which is at the same time acceptable to the Chinese milieu of the 11th century. This diplomatic effort explains many discrepancies, which were no problem to the initiate. Charles Willemen, M.A. in Classics (Latin and Greek), M.A.and Ph.D. in Oriental Studies, all in Belgium, where he has been a full professor since 1977. He is lifelong member of the Belgian Royal Academy of Sciences,and has been visiting professor in Nalanda, Benares, Calgary. He has written extensively about the spread of Buddhism from India to East Asia, both in books and in such periodicals as the Indian International Journal of Buddhist Studies, etc.